Simply getting started can be the most intimidating part of the process. Make it easier by taking it room-by-room: sort things into three piles—donate, sell, and keep. When you’re finished with a room, put those three piles into three separate marked boxes. One more thing before you’re done: before you place items in your “sell” box, put prices on them now. 2. Why you should price things. It might seem easier to not price things and just let people come up and ask about prices, right? Ask most yard sale regulars and they’ll tell you that if they don’t see prices on items at a sale, they’ll turn around and leave. Here’s why: the thought of asking a price or haggling for every single item is just too much work. So price things. You’ll be more successful and make things easier for your customers, too. 3. What you should price things. Use whole numbers. Most people don’t carry around a lot of change, so keep items priced in single dollar increments ($1 instead of $1.50). As a realtor, this is concept I am quite familiar with. As with a home, a yard sale’s location is absolutely everything. But what if you are located in an area that doesn’t receive a lot of foot traffic? Does a family member or friend live near a major road? See if you can “borrow” their yard for your sale and offer a percentage of your profits in return. Even better, combine your efforts and host a two (or even three) family yard sale! Yes, some people will learn about your yard sale on Craigslist (and I do recommend advertising your info on the site), but most people will find out about your sale the old fashioned way: by driving by one of your signs. I believe that signs will be your best marketing tool; but not just any sign will do. You can’t just jot down the details on a piece of paper and staple it to a telephone pole in your neighborhood the morning of your sale. 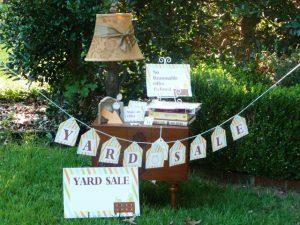 Make sure your signs are simple and easy to read (usually the words “Yard Sale” with an arrow, address, days and times are enough) and can be found on every corner in your neighborhood a week before your sale. 6. Split your sale into two shorter days. Sell everything half-off the second day – and make sure to advertise your second day sale! You’ll probably end up selling more items and making more money by the time the weekend is over. I wish you the best in your yard sale. If you have any tips or advice that has worked for you in the past, or if you’ve seen an unbelievably creative idea at a yard sale, please share. I would love to hear your thoughts!